The Eastern Shore church of Christ leaves today on a week long journey to the “hills and hollers” of Walker County, Alabama. 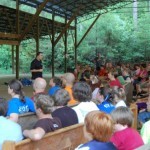 We will be involved, for the 9th year, with Clark Sims at Indian Creek Youth Camp. Upwards of 200 people will converge on the property there for a week of Bible training and fellowship. Previous post: Why Does Evil Exist?